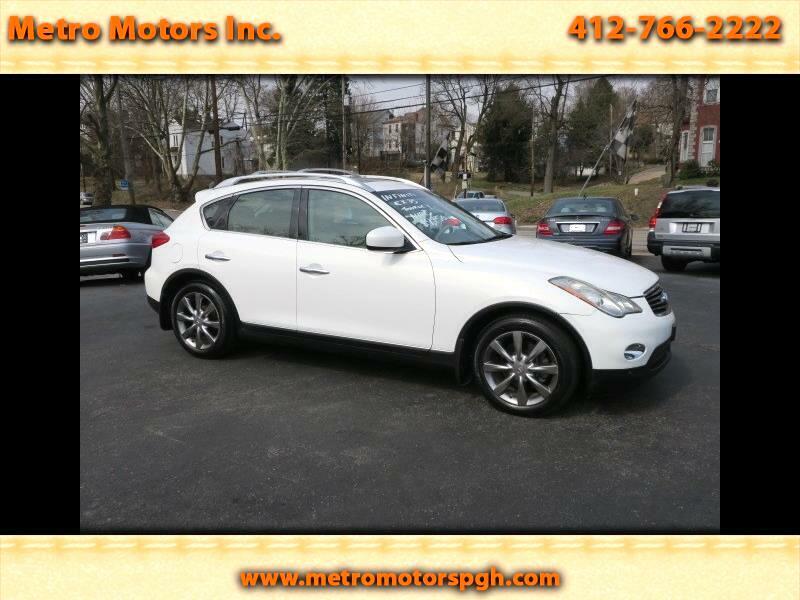 Used 2008 Infiniti EX EX35 4WD Journey for Sale in Pittsburgh PA 15202 Metro Motors Inc. Awesome 2008 Infiniti EX 35 "Journey Edition" Luxury Sport SUV. Truly a unique design inside and out! Finished in Moonlight White Pearl (Tri-Coat Pearl Effect Color) Parchment Leather Interior with Burl Walnut Wood Trim. 3.5 Liter V-6, Automatic, ALL WHEEL DRIVE. Built on the G model car chassis, and rides like a car, yet has a sporty handling feel. Bose Premium Sound System. CD, Bluetooth,Satellite. Dual Zone Climate Controls. Power Glass Moon Roof. Electronic Adjusting Leather Steering Wheel with Command Buttons. Surround Air Bag System. Full Power, Heated, Power, Memory, Lumbar Leather Seats. Front & Rear Parking Assist System. Fold Down Rear Seats. Roof Rack with tie down bars. All Original Books, Manuals, Key Fobs!! This garage kept beauty looks, runs Fantastic!! Just serviced with new Brakes, Tires, Inspection, Smog Tested. Clean AUTO CHECK HISTORY REPORT SHOWING NO ACCIDENTS OR ISSUES!! You will not find a nicer one!